Ice Or Snow Car Accident Claims How Much Compensation Can I Claim? In poor weather conditions such as snow and ice or below zero temperatures, car accidents on the road can often be very serious and sometimes injuries can be extremely debilitating and life altering, or even fatal. What we have found is that the people who have experienced such a car accident, are not only left with the physical pain and suffering that it can entail, but also the trauma of the memory of their accident. Also, people who were not directly involved, but instead their loved one/s, can be left with dealing with the aftermath such as their loved one needing care, or in very unfortunate circumstances, coping with their death. We can help you to claim compensation that reflects the impact that your snow or ice car accident has had on your life and so cover the costs and any financial losses incurred as a direct result of your accident. This guide will give you lots of information on how to make a compensation claim and more. A guide to making an ice or snow car accident claim. What is an ice or snow accident claim? What to do if you are involved in an ice or snow car accident claim. How to begin an ice or snow accident claim. Ice or snow car accident at work claims. Who is responsible for clearing the highway? Proving who is at fault in an ice or snow car accident. The effect the weather has on road accident numbers. What can be claimed for after an ice or snow car accident causing injury? The most common types of ice or snow car accident claims. The Law on Road Traffic Accidents. Accidents caused by another driver. How much compensation will I get after an ice or snow car accident causing injury? No Win No Fee ice or snow accident claims. Why choose us as your claims service for your ice or snow car accident claim? When winter comes and there is ice or snow on the ground, driving can become more hazardous due to the surfaces of the road becoming increasingly slippery and also visibility on the roads is often reduced. Accidents are more likely to occur if drivers do not adapt their driving to suit the weather conditions and also if local authorities do not take the necessary steps to prepare the roads properly, such as gritting, reduced speed restrictions etc when bad weather of forecast. When making car accident claims for accidents that occur when there is snow or ice on the road, it can be quite complex as it’s all about proving who is to blame, which isn’t always as straightforward as you’d expect. That’s where we can help. 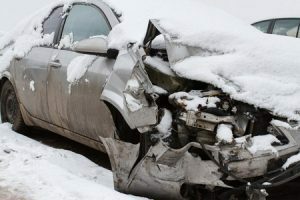 Read our guide to gather information about making ice car accident claims, to get an idea of the ice car accident compensation amounts and more. Of course, you can always ring us for free advice too. This refers to when someone has been involved in a car accident that has occurred where there is ice or snow present, that wasn’t their fault. It’s not only the drivers that are eligible to make a claim, innocent passengers or pedestrians can also claim compensation if they have been injured due to an icy road crash. All drivers are required to take extra care when driving in hazardous weather conditions, and the highway authorities have a duty of care to ensure things are put in place to improve the safety on the roads. If you have been involved in an accident that wasn’t your fault and suffered an injury as a result, then you will be able to make ice or snow accident claims. Third party details – If there were other people involved, get their details such as name and phone number if you can, but certainly details such as make and colour of their car and the registration number. This is particularly important as they can be traced with just their car details. Photos – If you are able, take photos of the accident such as car positioning, tyre marks etc. Or if you are unable to take photos, if you can , try to obtain photos that witnesses may have taken. These could help in proving who was at fault. Also, take any photos you can of your injuries you have sustained. These provide visual proof of your pain and suffering. Proof of expenses – Keep any proof of costs that you may have incurred as a direct result of the accident and the injuries you have sustained. These would include prescription fees, travelling costs, counselling costs and so on. Medical report – Make sure you see a medical professional to get your injuries assessed and documented. A report will be made that will not only list your injuries but will include recommend treatment, expected recovery time etc. This will be very useful in determining the amount of compensation you should receive. Starting car accident claims due to ice on the road will not seem as difficult if you have our help and take advantage of our service. All you would need to do is call us and we will sort out everything else and support you every step of the way of the claiming process. When you call us, we will offer you a free consultancy session where you can ask as many questions as you need to with regards to making your ice or snow car accident claim. We will then also ask you some questions as well just so that we have the necessary facts and understanding of your situation. Once you are satisfied that we have answered all of your questions, and we are certain that you have a case, we will begin to launch your compensation claim. You’ll be pleased to know that all of our specialist claims solicitors work on a No Win No Fee basis and so there is absolutely no financial out lay for you and no unexpected bills. You won’t be required to pay any legal fees until your case is successful. Sometimes a local medical needs to be arranged. It is nothing to worry about, we would arrange this for you at a clinic local to you and it wouldn’t cost you anything, but of course, we can discuss this during your free consultation. If you have had an accident in the snow or ice whilst driving a works vehicle in work time, then you will be able to make a claim. However, it would depend on the circumstances as to whether you would be claiming from your employer. If the accident was proved to be down to their negligence then you would claim against them, but if the accident was due to the fault of another driver or even the highways agency, then compensation would be claimed against them. As said earlier in the guide, this type of claim can be very complex and so by using our service, you will get the expert help, support and guidance you need whilst making your compensation claim and getting the payout amount you deserve. Tightness and reduced movement of the neck. The muscles are likely to feel hard or knotted. Pain and stiffness in the neck when trying to look over your shoulder. Pain is experienced when moving your head side to side or backwards and forwards. Headaches that start at the bottom of the skull and move towards the forehead. Car accidents are the most common cause of whiplash injury. If you have suffered with whiplash due to being in an icy road crash, then you will be able to make an icy car accident compensation claim. Just give us a call and we can help. Our expert solicitors have years of experience in car accident claims and will be able to launch your claim and get you the maximum payout that you are entitled to. It is the duty of the local authorities to keep the primary roads in their area safe to use under The Highways Act 1980. The Highways Agency also have a similar duty to keep the motorways safe and passable too. Both the local authorities and the Highways Agency are required to keep the roads clear of snow and ice. Usually this is done by spreading salt and grit to prevent the snow or ice settling in colder weather. To make a successful ice or snow car accident compensation claim, our injury solicitor needs to establish who was to blame and be able to show proof of this. There are obviously some roads that will be of greater priority when it comes to maintenance or pass-ability and will be identified by the local authority as being the primary roads in each area. The local authorities focus will be on these roads and this is where their grit supplies will be used so that the busiest roads with the highest volume of traffic are covered first. The AA suggest that drivers should expect at least 40% of the roads to be treated when expecting snow and ice. If an accident happens down a minor road, it’s possible that a claim would not be successful, however our professional team can always advise you on this. Even when the primary roads have been identified, the local authority is only required to take reasonable steps to clear the roads. It is not possible to completely clear a road of snow as it falls, and the rain combined with below zero temperatures can unfortunately cause black ice to form faster than the local authority can clear it. As you can see, it isn’t always clear who is at fault, but if you have had an accident on one of the primary roads and it can be proved that the local authority didn’t act accordingly to make the road safe, then a claim could be made. Keeping a check on weather forecasts allowing them to then be pro-active. Close roads that are deemed treacherous. Having a set program of activity in place for gritting and salting the roads. Keeping enough salt and grit in stock to do the job effectively. However, it is not just the local authority and Highways Agency that need to take precautions. Drivers themselves also have a duty of care when on the roads to drive in accordance with the weather conditions. For example, in particularly bad weather, they could cancel unnecessary journeys. When they are driving, they should reduce their speed and maybe even fit snow chains on the wheels if required. The Highway code has the rules set out so there really is no excuse. If a driver fails to take the necessary precautions to keep themselves and others safe on the roads in icy or snowy weather, then they could also be held to account of an icy road crash. If you are unsure as to whether you have a valid claim, ring us and we will endeavour to help you in the best way that we can. Weather conditions can have a huge impact on the amount of casualties on the road, but not necessarily how we’d expect. Bad weather can actually influence the number of casualties in both directions. For example, poor visibility and icy, slippery surfaces on the road can increase the likelihood of an accident occurring if drivers do not adapt their way of driving to suit the conditions. However, sometimes the fact that the driving conditions are poor, many drivers do naturally tend to drive slower and with more caution and so lessening the chance of an accident or at least preventing an accident from being so severe. Also, bad weather like snow can reduce the exposure to the chance of having a road accident. This is because, in times where there has been heavy snowfall, many road users have put their journey, if not necessary, off until it’s safer, and also motorcycle users and cyclists often change to a safer means of transport. The same can be said if there is also heavy rain or strong winds, again some road users will alter their plans or change to a safer transport method. So in conclusion, very bad weather can cause an increase in the chance of a road traffic accident happening due to poor conditions, but this is balanced out by the fact that drivers often alter their plans or just naturally drive with more care and attention. And so surprisingly, periods of bad weather can sometimes actually reduce the amount of accidents on the road as the reduction in potential accident exposure and decreased driving speeds, often outweighs the increased risks that poor road / driving conditions bring. Medical Expenses – Any costs that you have due to the result of your injury, you can claim for. So any prescription fees, or counselling costs etc. can be included. General Damages – This refers to the amount of compensation you will receive that reflects the pain and suffering you have experienced. Loss of Earnings – This refers to any loss of income incurred as a direct result of the injuries sustained and also covers the loss of any potential future earnings. Travel Expenses – Any costs of travelling to and from the hospital, any vehicle adaptions and any alternative travel costs would be covered. The legal rules and duties of people involved in road accidents are provided in the 1988 Road Traffic Act. There are numerous legal requirements that must be followed after an accident, the full legal text can be found here. Another vehicle or someone else’s property is damaged. An animal (cattle, sheep, horse, pig, goat or dog) is injured on the road. Damage to the infrastructure of the road (such as street lights, road signs, bridges etc) is apparent following the accident. If you are unfortunately in an accident, you have to exchange details with the others involved, the witnesses (if any) or the Police. The accident must be reported to the Police if the driver of the vehicle that’s involved in the accident does not exchange their details. Insurance documents must be produced if anyone suffers an injury in the accident. The accident must be reported to the Police if the insurance documents are not available whilst at the scene of the accident. The insurance certificate will need to be presented within 24 hours at the Police station if it was not available at the crash scene. Firstly, put your hazard lights on to warn other drivers. If at all possible, take photos of the scene of the accident including any possible causes or consequences such as the condition of the road, skid marks, debris etc. If the vehicle can be moved, position it in a safe place. Do whatever you can without putting yourself and others at risk, to make sure that the area and others involved are as safe as possible. Wait until you have been able to get advice before admitting responsibility. Exchange your details with the others involved. Include contact details, vehicle registration number, insurance details, etc even if someone else has admitted responsibility. If you haven’t got your insurance details to hand at the scene, then you must get in touch with the Police and be sure to present it within 24 hours of the accident. Speak to your insurance company as soon as you can and provide them with the details of the accident. Seek medical advice immediately if you are injured. A medical report will certainly help you with your case. Keep an account of any injuries you have sustained as a result of the accident, and also keep a note of any symptoms you may have and the effects the accident has had on your usual lifestyle. Make sure to keep a diary of any medical treatment you may have undergone as well as any medications you may be taking due to the accident. Keep a list of all the expenses you have incurred as a direct result of the accident. Keep an account of any loss of earnings due to the accident. If you have been involved in an accident at the fault of another driver, then you will be able to make a claim. Unless you are physically unable due to injury, you must make sure you exchange details with the driver involved as well as making a note of their vehicle and registration number. Take photos if possible and get any witness contact details that you can. All of these can help you with your case. Just give us a call and we will help and guide you in any way that we can to make your claim a success and get you the compensation you deserve as you shouldn’t have to suffer due to someone’s else’s negligence. One question we always get asked is how much compensation will I receive? Of course, we cannot give an exact answer to that question as every accident is different and can have so many variables to it. However, we can give you a list of the average payout amounts for common injuries sustained in icy and snow car accident claims. If you don’t see an injury that’s relevant to you, don’t worry, give us a call and we can help you with any questions. Loss of earnings £10,000 - £400,000 Earnings already lost will be taking into account as well as potential future earnings. There is the potential for a higher payout than the maximum based on the future earning potential of the claimant. Loss of benefits £5,000 - £500,000 This payout is based on the actual income lost, and again, there is the potential for a higher payout than the maximum depending on the claimants current payscale. Pain and suffering £1,000 - £200,000 How much the claimant will receive depends on the severity of the pain and suffering experienced. Minor brain injury £1,675 - £9,700 Brain damage will be minimal in these cases if any at all. The amount of compensation awarded will depend on the absence or presence of headaches. It will also depend upon the extent of continuing symptoms, the period of recovery and the severity of the initial injury. Severe chest injuries £76,500 - £114,100 This refers to serious heart or lung damage. Prolonged pain and suffering will be present. Less severe chest injuries £9,575 - £13,650 This refers to cases where the chest damage is fairly simple, but may have some minor permanent tissue damage, but no long term effect on lung function. Severe head injury / Very severe brain damage £214,350 - £307,000 The extent of the physical limitations, the life expectancy and degree of insight will determine the level of compensation awarded. The maximum payout would depend on there being very little if any language function and communication and also if the claimant is responsive to the environment around them. Minor shoulder injury £350 - £6,700 Pain and short term restriction of the arm as a result of the injury. Moderate shoulder injury £6,250 - £9,750 Pain and limited movement of the arm. Severe shoulder injury £9,500 - £37,000 Pain and impaired movement of the arm. Minor neck injury £1,800 - £6,200 Pain and short term damage to the neck such as whiplash. Moderate neck injury £29,600 -£42,300 Long term damage causing pain and restricting movement. Severe neck injury £35,500 - £112,450 Severe pain and impairment of movement, possibly even paralysis. Minor back injury £350 - £9,850 Temporary damage to the back with short term pain. Severe back injury £29,750 - £123,300 Loss of motor function or even paralysis. Minor leg injury £1,800 - £17,900 Fracture or break one or both of the legs that will heal given time. Moderate leg injury £21,750 - £104,100 Loss of function of one or both of the legs. Severe leg injury £75,100 - £215,000 Having to have an amputation of one or both legs. All of our car accident claims specialists work on a No Win No Fee basis. What this means is that you will not be needed to pay anything until your claim is made successful and your compensation will cover the cost. However, if your claim wasn’t successful, you wouldn’t have to pay us anything at all. Making any sort of injury claim due to an accident can be a long, drawn out process and if you choose to work with a solicitor who is paid by the hour, you could find yourself with some large legal fees without any guarantee that compensation will get paid. With No Win No Fee you really have nothing to lose, there is no financial gamble with us. As our payment relies on your compensation claim being successful, we will work all the more harder to ensure the maximum amount of compensation is paid out to you. We are a professional, friendly and highly experienced injury claims law firm that treat all of our clients with respect and empathy. We do our upmost to achieve the best compensation payouts that our clients deserve in the most efficient and thoughtful manner possible. We understand that you are having a rough time at the moment and will treat you with care and consideration and be discrete at all times. We have been in the personal injury claims industry for many years and have had thousands of extremely successful car accident claims payouts, and with our expert solicitors help and guidance, your claim will be a success too. We are honest and reliable and always put our clients first. Our reputation really does speak for itself. If you have been involved in an ice or snow car accident and want to make a claim or have any questions, all you need to do is call us on a href=”tel:08000738804″>0800 073 8804. Your call will be answered by a member of our professional team who will be more than willing to help you in any way possible. They can talk you through the claiming process so you have a better understanding of what’s involved and how to get started. This link is for the Department of Infrastructure’s explanation about their salting processes and when and where they be do it. It also gives advice on what to do when the roads have ice or snow on them in accordance with the Highway Code. This link takes a website with information regarding work related road safety. This will contain useful information if you have had a car accident whilst at work. This is a link to the governments website that gives information about what to do if you’re involved in an accident. But also, it gives information about how to deal with being involved in an accident with an uninsured motorist. This is the Road Traffic Act 1988. This leads to the NHS guide to whiplash. This leads to another of our guides on general car accident claims which may provide you with extra information in addition to this guide.